Amazon is getting ready to tread on the well-worn path that Apple, Samsung, LG, and countless others have already blazed. 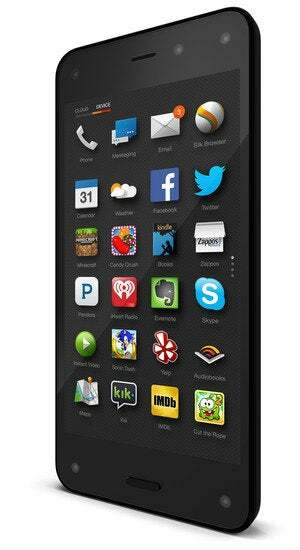 So how does the soon-to-arrive Amazon Fire Phone stand out from the rest of the smartphone crowd? By playing to Amazon’s strengths—e-commerce and access to digital content—to build a device that’s not so much a phone as it is a shopping device that also lets you make phone calls. But there’s more to it than that—a lot more. We had some hands-on time with the Fire Phone after Wednesday’s unveiling, and we’ve got answers about any questions you might have about the latest marquee entry to the smartphone market. Amazon CEO Jeff Bezos holds up the Fire Phone at this week’s press event. When is the Fire Phone available? The Fire Phone arrives on retail shelves on July 25. You do not need to twiddle your thumbs between now and then, however; Amazon is taking preorders now if you’ve decided that you seen enough already and can’t wait to hand over your credit card info to Jeff Bezos. What capacities does the phone come in? You can choose between two sizes—32GB and 64GB. The 32GB phone will cost you $199 with a two-year contract. Amazon would like you to know that you’d pay the same price for a 16GB iPhone 5s or 16GB Galaxy S5. 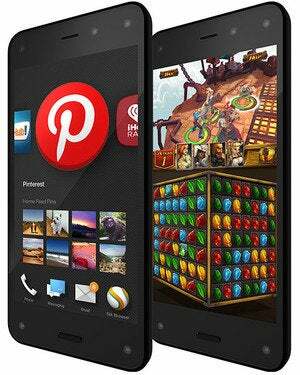 Jumping to the 64GB version of the Fire Phone will add another $100 to the price tag. If you skip a contract, you’ll pay $649 and $749 for the 32GB and 64GB, respectively. OK, so which carriers do I have to sign the contract with? AT&T will be the exclusive carrier for the Fire Phone. That’s a bit of a departure from how Amazon has previously handed wireless connectivity for its mobile devices—you can get a Kindle Fire HDX tablet that works on either AT&T or Verizon, for example. It’s a double-edged sword for Amazon, obviously. On the one hand, exclusivity gives Amazon access to AT&T’s massive customer base and reach. (AT&T is the second-largest mobile carrier in the country, after all.) But would-be customers who don’t want to do business with AT&T—either because of poor dealings with the carrier in the past or poor coverage where they live—will end up taking a pass on the Fire Phone, at least until it becomes available through other carriers. Whenever that might be. 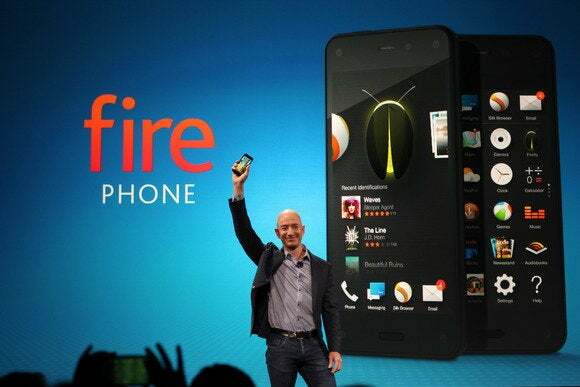 Jeff Bezos didn’t really talk much about the specs inside the Fire Phone. What’s inside of it? Wednesday’s presentation focused more on what you can do with the phone, that’s for certain, but if you’d like to know what’s powering the Fire Phone, you’ll find the specs toward the bottom of the Fire Phone’s Amazon store listing. The phone runs on a 2.2GHz Quad-core Snapdragon 800 CPU, with Adreno 330 graphics processor and 2GB of RAM. That’s not the highest-end mobile processor—that honor goes to the Snapdragon 801, which you’ll find inside the Galaxy S5, the HTC One M8, and the LG G3. But it’s still quite good: The Snapdragon 800 CPU powered the top phones at the end of 2013 and the start of this year. The Fire Phone features a 2400mAh battery, which Amazon says can last for up to 22 hours of talk time, 11 hours of video playback, or 65 hours of audio playback. We’ll see how those numbers stand up against our battery tests once we have a phone in hand, of course. That said, it’s a pretty common battery capacity among flagship smartphones. Then again, most flagship smartphones aren’t constantly processing data from four always-on front-facing cameras—more on that Fire Phone feature below—so how the phone’s battery performs will definitely be at the front of our minds when we get a chance to really test this model. Are there any other noteworthy specs? 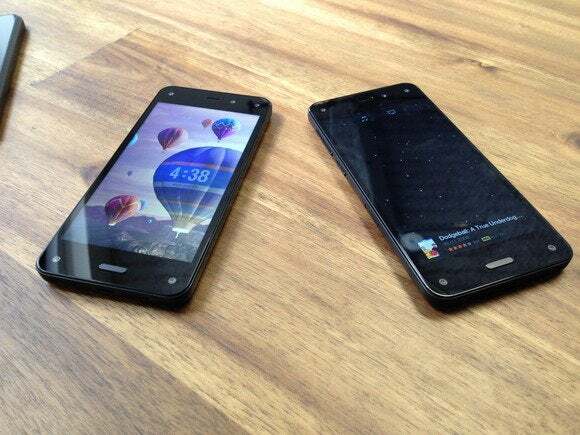 Let’s talk about the screen on the Fire Phone. It’s a 4.7-inch HD LCD display, with 1280 x 720 resolution; Amazon says there are 315 pixels per inch. That lags behind what LG offers in its recently released G3, but then again, the Quad-HD display is the LG phone’s calling card. Still most top-end Android phones—the Galaxy S5 and the HTC (M8) just to name a pair—provide 1920 x 1080 full-HD displays, so it’s not unfair to say the specs on the Fire Phone don’t measure up here. (The pixels per inch are more in line with what you find in the iPhone 5 lineup.) Then again, the Fire Phone has another display trick up its sleeve—a 3D-like effect that we’ll describe in full detail below. How about the phone’s design? The Fire Phone doesn’t feel much different than other high-end smartphones: It’s got Gorilla Glass 3 on the front and back, and a rubbery strip around the side that gives you something to grip. At 5.64 ounces, it feels more heavy and substantial than the 3.95-ounce iPhone 5s, and the Fire Phone’s 4.7-inch screen feels roomy compared to the iPhone’s 4-inch screen. Still, it wasn’t hard to navigate one-handed, thanks to the gestures that let you call up menus by twisting and tilting your phone in midair. A dedicated button on the Fire Phone’s left side lets you quickly launch the camera app and take photos (by pressing once) or engage the Firefly feature (with a long press). That button is easy to find with your fingers if you’re holding the phone with your right hand, or your thumb if you’re using your left—great placement. Amazon’s emphasis on premium materials extend to the Fire Phone’s earbuds. We didn’t get to test drive their sound, but they have a flat cable that resists tangling when you shove your ’buds deep into the pocket of your jeans, and the two earbuds even stick together with little magnets, which helps prevent knots too. The Fire Phone’s stereo speakers sounded respectably loud even in a chaotic demo room; Amazon says it uses Dolby Digital Plus to simulate surround-sound and adjust the volume based on what you’re doing. Does the phone run on Android? Kind of. 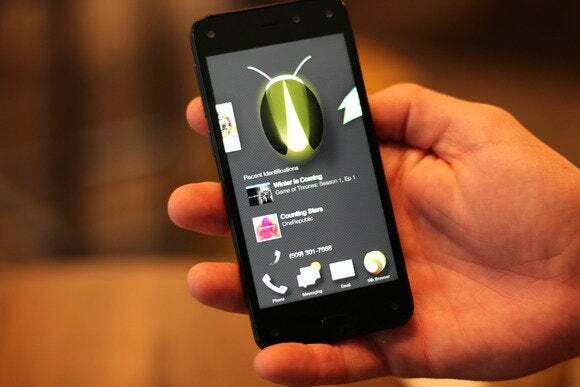 The Fire Phone runs Fire OS, a forked version of Android that looks very little like the Android you’ve gotten to know. It has Amazon’s own overlay, unique features you won’t find in stock Android, and its core apps are all Amazon’s own. Amazon’s Kindle Fire tablet is also powered by Fire OS, but a slightly older version, Fire OS 3.0 “Mojito.” The Fire Phone runs Fire OS 3.5.0, which adds in support for the Fire Phone’s dynamic perspective, as well as other features. What’s the phone’s interface look like? If you’ve used a Kindle Fire tablet, it’s familiar, but even if you’re totally new to the platform, it’s pretty simple to grok. The main home screen shows the Carousel, which is a side-scrolling display of recently used apps. You’ll see a large icon (that moves as you reposition your head or tilt the phone, thanks to Dynamic Perspective) for each app, along with contextual information below it—previews of a couple recent email messages, for example, or the last few pictures you took with the camera app. This makes it easy to resume whatever you were just doing. You can pin items to the Carousel, too. The Caroursel on the Fire Phone offers a side-scrolling display of recently used apps. To get to the rest of your App Grid, you swipe up from the home screen, and you can organize that grid however you like. The App Grid can even include content like your favorite books or movies, and you’re allowed to use folders to group related items together. With no physical or software Back button, you have to swipe up from the bottom of the screen to go back, or just press the Home button at anytime to go home, of course. Extra menus can be pulled in from the left and right sides of the home screen, either by giving the Fire Phone a quick, snappy tilt, or just dragging them in with your finger. The left-side menu has shortcuts to different kinds of media, like Videos, Photos, Books, Apps, Games, and so on, and the menu on the right side shows your notifications and glanceable info like calendar appointments and today’s weather. So what kind of apps will run on the phone? The Amazon Appstore isn’t nearly as full as iOS’s App Store and Android’s Google Play Store, with around 240,000 apps compared to more than 1 million in the other markets. Even though it runs a modified version of Android, not every Android app is going to be compatible with the Fire Phone; you can’t just download anything from Google Play and expect it to work. Amazon’s Appstore features 240,000 apps, though you won’t find all your favorites there just yet. Like any smartphone, the Fire Phone comes with a bevy of built-in apps that you can start using right away, including Email, Calendar, Messages, Clock, Calculator, and Maps. Content and shopping are Amazon’s bread-and-butter, so of course Fire OS has some apps to support that. On the content front, there’s Books, Amazon Instant Video, Amazon Music, and Audiobooks; for shopping, there’s Shop and the Amazon Appstore. As for third-party apps, you’ll find that many favorites are already in the Amazon Appstore, including Facebook, Twitter, Pandora, Candy Crush, Yelp, and Mint. Notably missing are Instagram, Pinterest, Uber, and Whatsapp. You also won’t find many of the Google apps that both Android and iOS users have come to depend on: No Gmail, Chrome, Maps, or Drive. Amazon promises that more third-party apps are in development for Fire OS and will be ready come July 25 for the Fire Phone’s launch. You mentioned Maps. Who’s supplying the data? Nokia Here supplies the data to the Fire Phone’s Maps app. That sounds like the kind of question from someone still scarred by Apple’s iOS 6 Maps rollout. In the case of the Fire Phone, the map data comes from Nokia’s Here map program, but there’s an Amazon flare. The Maps layout plays nicely with Dynamic Perspective, showing landmarks, buildings, and other points of interest in its faux-3D illustrations. It will include turn-by-turn directions and public transit data at launch, but there’s no word on if it will show traffic or walking directions. What about the phone’s screen? Is it really 3D? Amazon is calling the 3D effect “Dynamic Perspective,” which describes it quite well. Flat images have a fixed perspective and single vanishing point, so they look the same no matter where you head is. As we mentioned when talking about specs, the Fire Phone has four cameras in the corners of its face that track the position of your head (even using infrared to see you in the dark), and once they determine the X, Y, and Z axes of your head, the phone can adjust the image’s perspective dynamically as your move your head or tilt the phone. This gives items on screen a fuller, rounder, 3D feel—if you want to see the side of the Firefly icon, you can just peek your head to the left, and the icon rotates to give you a better look. On any other phone’s screen that would be a static icon, of course. It’s a cool, almost spooky effect, both in the Carousel and especially in the special lock screens Amazon designed to really show it off. (But don’t take our word for it—we made some Vines of the Fire Phone in action so you could see for yourself. Is there any practical use to the 3D effect? Yes, as a matter of fact. One example Bezos gave in his demo was the Fire Phone’s built-in Maps app. The map app’s buttons are on a different layer than the actual map image beneath them, so if a button is obscuring the name of a street, you can move your head or tilt the phone to shift the perspective a little bit, which will show you what you’re missing. Tilting the phone also lets you see more layers of information, like Yelp results in floating windows that would clutter up the display if they were visible all the time. That’s just one example, and Amazon has also released an SDK for developers to integrate Dynamic Perspective into their own apps. This could lead to all kinds of interesting applications, like games you control with your head, shopping apps that give you a 3D look at products, real estate tours that let you look around a room without strapping on virtual reality goggles—whatever they can dream up and build. How do I use the Firefly feature? It’s a piece of cake! To turn it on, you just long-press the button on the Fire Phone’s left side. It launches almost instantly, and you’ll see what the back camera sees, with an overlay of little firefly-like dots whizzing around to show you it’s ready. Then you just point your phone at objects—Firefly can recognize product packaging, books, CDs, video games, and movies thanks to Amazon’s huge database. It works all around your environment, too: Firefly can recognize thousands of famous works of art, and if you tap the floating Music or Video buttons, Firefly will listen with its microphone and identify whatever song, movie, or TV show is playing, just like Shazam. Point your phone at just about everything, and the Firefly feature will be able to recognize it. Firefly’s speed is pretty astonishing, and as it recognizes items, it adds them all to a list. You can scan things back to back to back and pull up the list anytime. Tap on a result in the list to see potential actions: Obviously a lot of these are going to be offers to sell you that very thing on Amazon. If you Firefly a book cover, the list will have links to buy it in Kindle format, paperback, hardcover, Audible audiobook—whatever Amazon sells. But developers have a Firefly SDK to add deeps links to third-party apps, too. In our demo, when we identified a song, one option was to start an iHeartRadio playlist based on that song or search for concert tickets on StubHub.